The State Capitol’s Spring 2010 exhibit, Our Uncovered Past, offered an overview of conservation, research, and interpretive efforts of the Arkansas Archaeological survey over the preceding decade. Presented in collaboration with the Survey, a division of the University of Arkansas System, the exhibit prominently featured the results of the Survey’s partnership with units of the Arkansas Department of Parks and Tourism, including Davidsonville Historic State park. Located on the Black River in Northeast Arkansas, near Pocahontas, Davidsonville was Arkansas’s first county seat and its establishment in 1815 made it one of the earliest European settlements in what would become Arkansas. 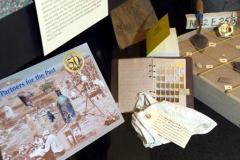 The exhibit offered a sampling of Davidsonville artifacts, including buttons, lead balls, animal remains, and fragments of an early Dutch oven, the humble iron pot later designated the state’s official historic cooking vessel. Our Uncovered Past also spotlighted the Survey’s longest-running partnership: the Arkansas Archaeological Society, which observed its 50th anniversary in 2010. Since 1964, the Society has collaborated with the University of Arkansas Museum and the Arkansas Archaeological Survey to provide opportunities for members to learn the techniques of professional archaeology in classroom and field. In 2007 and 2008, the Society’s Summer Training Program excavated the Jones Mill site near Malvern. On view are some of their finds, including stone tools, projectile points, and stone sinkers used to weigh down nets once used to harvest the fish of the nearby Ouachita River. The State Capitol’s Summer 2010 exhibit, Helping People Help the Land, highlighted the 75-year history of the natural Resources Conservation Service (NRCS) in Arkansas. In 1935, after years of crippling multi-state droughts, the federal government took a bold step for resource stewardship by creating the Soil Conservation Service, a new agency within the U.S. Department of Agriculture. Its mission was to help farmers, ranchers and other private landowners care for their most fundamental asset and resource: soil and what covered it. Renamed the Natural Resources Conservation Service in 1994, the agency marks its 75th anniversary in 2010. 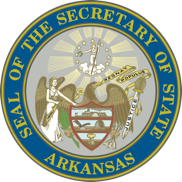 Helping People Help the Land, created by the Little Rock office of the NRCS in cooperation with the Arkansas Secretary of State’s office, offered a glimpse of NRCS projects and programs in Arkansas. Historic photographs and “tools of the trad” documented the creation of Lake Bennett (named for the Service’s first director) in Faulkner County and other early undertakings, while more recent images highlighted current projects across Arkansas, funded by the American Recovery and Reinvestment Act. Arkansas in 1860: On the Eve of Conflict included personal effects of Omer Rose Weaver, a young man-about-town of 1860 Little Rock, along with the intriguing story of “The Family,” Arkansas’s first political dynasty. Weaver moved freely in Arkansas’s social circles, and one of his fancy vests ins featured near a copy of a $15.00 invoice for a similar vest. The cost of the vest was equivalent to a month’s wages for a working man of the day.Arkansas in 1860: On the Eve of Conflict told of a pivotal year in Arkansas’ history through images and artifacts depicting life in pre-Civil War Arkansas. The exhibit highlighted the topics of transportation, society, plantation agriculture, and the politics of 1860, as well as the profound transformations within these areas of a state on the brink of secession. 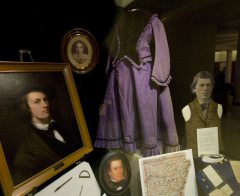 The exhibit contained artifacts and documents from the collections of the Arkansas History Commission, as well as materials loaned by several state parks, Arkansas State University and private individuals.